I think by now, you all know how much I love my gator! I just go bonkers over this meat, and I can’t control myself. So Mom made a meal that she can use as dog training treats when we are out and about. And I think this was a hit! Cut food into 3/8″ thick slices. 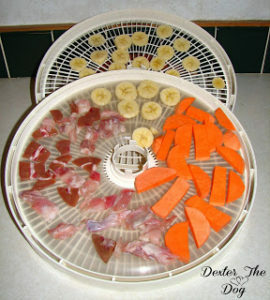 Place ingredients on dehydrator rack. Dehydrate until done, approximately 9 hours. Has your dog or cat eaten alligator meat? Did they like it? Tell me in the comments.